Break the Velakkaya as you break a Coconut. Scoop the pulp and keep it in a bowl separately. Wash & clean the green chilies and cut them into pieces. Break the red chilies into pieces and keep them aside. Heat a pan and add oil to it. When oil is hot add the fenugreek seeds and black gram. Fry the seeds till they change color to golden brown. Then add mustard seeds and fry till they splutter. Add the green chili pieces and fry well. Add the red chili pieces and asafoetida and mix well. Fry the seasoning till the green chilies change color. Take this fried seasoning, without oil, into a mixie jar. Grind the fried seasoning to a coarse powder/paste. Now add the scooped Velakkaya pulp and run the mixie shortly (Just to mix). Transfer the ground chutney into a plate a mix well with fingers. Add the chopped coriander and mix again. Transfer this to a serving bowl and serve with hot plain rice. While selecting the Velakkayalu, sniff & check. Check whether the Velakkayalu are ripe or not by sniffing. If they are ripe you will feel a sweet smell when sniffed. If the Velakkayalu are not ripe enough keep them in hot sun for 1 or 2 days till they are ripe. If they are not ripe the pulp will not come out of the shell when scooped and it also tastes somewhat bitter (VAGARU). So take care to select semi ripe Velakkayalu for this Pachhadi. Semi ripe ones are sour & soft and are perfect for preparing this Pachhadi. While breaking the Velakkaya take care not to hurt yourself. Just break it the way you break a coconut. Scoop the pulp with the help of a spoon. If you want to preserve this Pachhadi for a longer period, avoid Black gram, Green Chilies and Coriander. Fry in oil fenugreek seeds and mustard seeds followed by red chilies and asafoetida. Grind this seasoning and mix with the pulp of Velakkaya to get a long lasting Pachhadi. Buy Velakkayalu in season, scoop the pulp and add salt & turmeric powder. Mix well and store in an air tight glass jar. This will stay for a long period (nearly a year). Whenever you want to make this Pachhadi take some prepared pulp and mix with fried and ground seasoning. 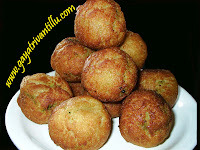 I am a decent cook but get very scared while making typical andhra dishes especially pachadis. - I am comfortable with north indian cuisine. My husband on the other hand wants andhra dishes. Thanks to you now I am getting better at it - yesterday I made the allam pachadi - it turned out just like the one that our grandmothers make- too good . I am also making the velagkaya pachadi more often these days.Thank you so much. 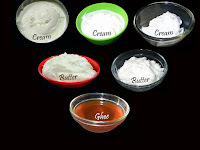 me vantalu chala bagunayee.naku chala nachayee..nenu yadina variety ga cheyalianipistay me website chusi cheystanu..
Hello Gayatri garu, you have an awesome website with mouthwatering recipes. Kudos! to your expertise.